I am a bit nervous about sharing my card as I've not shown my cards to anyone ever not even friends or family. Every one of us will relate to this as we are all our own worst critics. We make a card and for whatever reason we think it is not good enough. 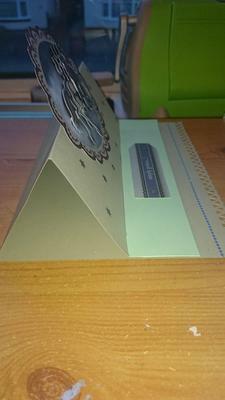 So to them the cards that we card makers do make are always a special treat and well received by them. And the comments that come from them should spur us on to make even more. And don't forget that the more you make the better you will become. So I would say to you Cat that your card is very pretty and for a first attempt at the Easel card it is well done. The addition of the stars makes it sparkle and you should be proud of your efforts. Please don't hide them away ... give them to friends and family whenever the occasion arises. 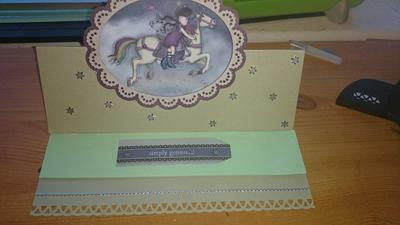 Make them special cards for their Birthdays and have fun making your own Christmas cards too. You will be surprised at the lovely comments that you get ... especially from the wonderful visitors to this website. And please please don't be afraid to add more to the Gallery as you make them. You card is beautiful Cat. Be proud of your creations, you will be so pleased when the recipient is incredulous that you made it. Carry on card making and please, give them to people, that's what it's all about!! What other lovely surprises are you hiding away? Your easel card is lovely and I would be proud to receive one. Please do not hide your lovely creations away, share them with us and give them to your family and friends who I am sure will appreciate them. Happy crafting and keep on creating lovely cards. I know what you mean, have had the same feeling when I started 6 months ago, but now I share all my cards and also give away. Your card is so lovely, so just be proud and go for your next one. I really love your card! it is a very nice one. do not hide it, but show it, you can be very proud! Hi Cat, the more you do the more confident you'll be. You'll get double the buzz of making the card when you get feedback from your recipients. Nice easel card. Do not hide anymore of your cards away. Give them to friends and family and let them get the same enjoyment from them that you do making them. I am sure the rest of them are lovely and the more you make the more confident you will be.